SOME OF THE INSECTS AFFECTED BY NEEM PRODUCTS. American Cockroach: Reduces fecundity and molts, reduces number of fertile eggs. Bean Aphid : Reduces fecundity, disrupts molting. Boll weevil : Inhibits feeding. Brown planthopper : Inhibits feeding repellent, disrupts growth, making failures and sterility. beetle : Eggs fail to hatch, larvae fail to molt with azadirachtin levels as low as 3ppm inhibits feeding. Confused flour beetle : Inhibits feeding, disrupts molting, molting, toxic to larvae. Cowpea weevil : Inhibits feeding, toxic. Diamondback Moth : Strongly suppresses larvae and pupae, retards growth, inhibits feeding. Fall armyworm : Retards growth, repels adults, inhibits feeding, disrupts molting, toxic to larvae. Flea : Retards growth, repels, inhibits feeding, disrupts growth, eggs fail to hatch. Flea beetle : Inhibits feeding. Fire ant : Inhibits feeding, disrupts growth. Green leafhopper : Inhibits feeding. Gypsy moth : Retards growth, inhibits feeding, disrupts growth. Head Lice : Kills, very sensitive to neem oil - traditional use in Asia. Horn fly : Repels, retards growth, disrupts growth. Housefly : Inhibits feeding, disrupts molting, repels. House cricket : Disrupts molting. House mosquito : Toxic to larvae. 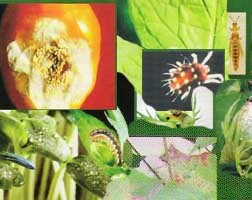 Japanese beetle : Repels, retards growth, inhibits feeding, disrupts growth. Khapra beetle : Inhibits feeding, disrupts molting, toxic to larvae. Large milkweed bug: Toxic, disrupts growth. Leafminer : Retards growth, inhibits feeding, disrupts molting, toxic. Mealy bugs : Repels, inhibits feeding. Meditterranean Fruit fly : Disrupts growth, toxic. Mexican bean beetle : Retards growth, inhibits feeding, disrupts molting. Migratory locust : Stops feeding, converts gregarious nymphs into solitary forms, reduces fitness, adults cannot fly. Milkweed bug : Difficulty in escaping the "skin" of the last molt, disrupts molting. Oriental fruit fly: Arrest pupae development, retards growth, toxic to larvae. Pink hollworm : Retards growth, inhibits feeding. Red flour beetle : Inhibits feeding, toxic. Rice gall midge : Toxic. Rice weevil : Inhibits feeding, disrupts growth, toxic. Serpentine leafminer : High pupal mortality, retards growth, inhibits feeding, disrupts molting, toxic to larvae. Sorghum shoot fly : Inhibits feeding. Spotted cucumber beetle : Retards growth, inhibits feeding. Tobacco budworm : Inhibits feeding. Tobacco hornworm : Inhibits feeding, disrupts growth, toxic. Webbing clothes moth : Inhibits feeding, disrupts molting. Western thmps : Retards growth. Whitefly : Repels, retards growth, inhibits feeding. Yellow-fever Mosquito : Kills larvae, disrupts molting. Source: Development and Ecological Role of Neem in India.